While we might regularly speak of collaboration, we rarely reflect on the term’s realisation outside theoretical realms. What is collaboration and what does it actually mean to collaborate? Its Latin origin, ‘con’ and ‘laborare’, indicate a process of working together. The collaborator also relates to the French collaborateur: an employee or a colleague. Its linguistic meaning refers to equal partners collaborating with each other, in order to achieve a common goal. Collaboration, too, has a historically negative connotation from wartimes, specifically in the German language (Kollaboration), in which the collaborator was known as a traitor who would collaborate with the enemy in a one-hand-washes-the-other deal. Browsing the word in the Internet offers a few more nuances and meanings to choose from: Thesaurus suggests several synonyms, such as cooperation, alliance, participation or simply teamwork. And Wikipedia lists exemplary classic cases of collaborations, which include, for instance, the utopian communities of Israelian Kibbuzim, the joint ventures of large capitalist enterprises and – quite surprisingly – it introduces the otherwise little known former art school Black Mountain College as an example of collaborative academic practice. While paradoxically Wikipedia’s wide readership, and a majority of people in the European art scene never even heard of Black Mountain College, most will be familiar with Black Mountain’s famous teachers, such as Josef and Anni Albers, Jon Cage, Robert Creeley, Merce Cunningham, Buckminster Fuller, Robert Motherwell, and many of its students, such as Kenneth Noland, Robert Rauschenberg, Dorothea Rockburne or Cy Twombly. Significantly less popular than one of its influential predecessors – the Bauhaus – Black Mountain College was radically collaborative in its practice of interdisciplinary work, in its educational system and its encouragement of creative production, fostering the emerging avant-garde from music, poetry, art, theatre, design, architecture, economics, psychology, math and physics. Set in utopian circumstances on the countryside, Black Mountain College was located in an isolated and rural part of North Carolina, while the school maintained its network with New York’s art scene. Founded by Andrew Rice, Theodore Dreier, Frederick Georgia, and Ralph Lounsbury – all of which had just been fired by Rollins College – in 1933, and forced to close under the direction of Charles Olsen in 1957 due to a lack of financial stability, Black Mountain existed in a time that motivated many to retreat into collective and idealist formations, developing alternative lifestyles during the time of the Great Depression and World War II. With our project Black Mountain Research, we – students and scholars from the university, curators and researchers from the museum – accompanied the preparations and the realisation of the exhibition “Black Mountain. Ein interdisziplinäres Experiment 1933-1957” at Hamburger Bahnhof – Museum für Gegenwart, Berlin and continuously re-encounter the question if and how a system such as Black Mountain could be established in our current society? Could it be re-invented or is it only a template? What can we learn from its community structures? Which practices did we forget over time? Which ones have we been we ignoring? What has changed since then? What needs to be re(dis)covered? As opposed to today’s frequent stream of information through digital techniques, Black Mountain was isolated from urbanisation. It was liberated from exam systems, grades and strict schedules. Black Mountain created an access to a free education system, which was in part possible because of the school’s rejection of its own commercialisation by accepting to function with hardly any funding. 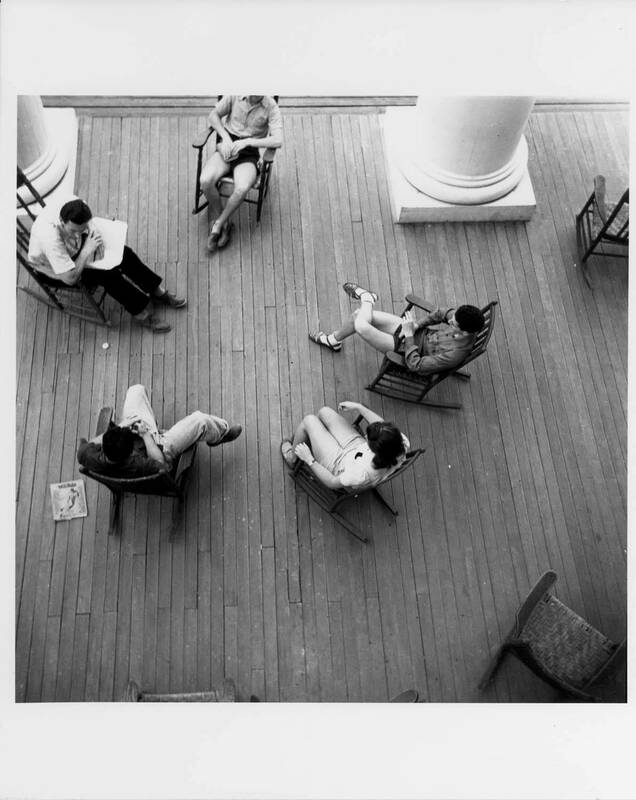 More significantly, however, Black Mountain College was successful in its experimental nature, because of its collaborative, cross-disciplinary and cross-hierarchical practices within the community they had established – a basis of trusting in the group and in inspiration that motivates and enhances each other’s practice. Collective conscious, in the sense of the term’s coinage by French sociologist Émile Durkheim in The Division of Labour in Society (1893), had a higher priority than determined, effective techniques of commercialising the student’s and the teacher’s art and research. What we lack today – this is no news to anyone – is time. On the contrary, our current educational systems, including those in the arts, enforce an early professionalization and a quick employability; the rapid finding of an aesthetic language or of a strong position that serves as a signature gesture for one’s own individual career. What we also lack – this might involve a bit of pathos and really is no news either – is concentration and focused work provided by an isolated location outside an urban, information-generating society that the newly invented social phenomenon ‘Generation Y’ already began to despise. But what we really lack – and this is what I would like to pledge for – is a curiosity not only in our own optimisation, but especially in the development of our community; in our collaborators: our partners, who we are working with. A curiosity in collaboration as an act of multi-disciplinary experimentation.